The DINAA project had a very successful reception at the 79th Annual Society for American Archaeology conference in Austin, TX last month. With several presentations spanning traditional conference papers, posters, and a lightning talk at the Digital Data Interest Group meeting, conference-goers were provided with no shortage of opportunities to learn about multiple aspects of the project and its implications for the future of archaeological research. David G. Anderson (University of Tennessee) presented his paper, “Using CRM Data for ‘Big Picture’ Research,” detailing the importance of CRM research in the development of Archaeology over the last forty years. Giving credit to the hundreds of thousands of technical reports and other forms of archaeological data stemming from ever-increasing amounts of CRM research in the Southeast, Anderson says this is the basis on which big picture research can now be accomplished. As technology and storage have caught up with the massive scale of new archaeological questions, digital repositories like DINAA can be utilized as highly effective tools. Joshua J. Wells (Indiana University South Bend) presented “Public Data for Public Archaeology: Developing Linked Open Data, Open-Source GIS, and Sensitive Data Standards for the Digital Index of north American Archaeology” on behalf of his co-authors (E. Kansa, S. Kansa, Yerka, Noack Myers, DeMuth and Bissett) discussing the relationships between archaeological linked open data and the very same “Big Data” discussed by Anderson. Intersecting with law, research, education, and ethics, the perspectives of anthropology, informatics and cybernetics accommodate a unique look at the broad scope of implications of this type of research and work to prevent disuse, misuse and abuse as we navigate new human vs. technological problems. Eric Kansa took the lead on presenting “Navigating and Visualizing Archaeological Data on Vastly Different Scales” for coauthors Yerka, S. Kansa, Anderson, DeMuth and Wells. Archaeological research can focus closely on individual objects, or cover a broad span of time over multiple millennia and continents. Data indexing managed by Open Context for DINAA facilitates these types of multiscalar research, hierarchically nesting both temporal and geographic data with a simplified interface and spectacular visualization. Due to the practical aspects of air travel with a large poster, this poster was printed on fabric for easy packing (at Spoonflower.com), which came in very handy during informal chats in between sessions. When the question “what is DINAA?” came up in conversation, the poster could easily be retrieved from a pocket or briefcase. Kelsey Noack Myers took the lead on discussing “The Anthropology of Archaeological Data Collection and Management” for coauthors DeMuth, Wells, Yerka, Bissett, Anderson, S. Kansa, and E. Kansa. This poster detailed the process of defining cultural terms based on published archaeological literature and delineating the ways in which archaeological data are organized based on the aspects that are held to be most pertinent. By demonstrating the differences in metadata terminology choices, the use and associations of words can be made more explicit. R. Carl DeMuth was present digitally via video call on a tablet to accompany the poster on which he was the lead author, “Examining DINAA’s Potential To Reframe Our Archaeological Vocabulary,” along with Noack Myers, Bissett, Anderson, Wells, S. Kansa, E. Kansa and Yerka. This poster asks viewers to consider the terms used by State Historic Preservation Offices (SHPOs) and the effects discordant vocabularies may have on the interoperability of database research between states, while highlighting DINAA’s translation abilities as a tool for approaching multi-state analyses. Bryan Dull, a student at IU South Bend, was the lead author of “Archaeology and Open Source Learning: Uses of DINAA for University Courses in Culture Areas, GIS, Heritage Management, and Outreach,” with Wells, Yerka, E. Kansa, Anderson, S. Kansa, Noack Myers, DeMuth, and Bissett. Providing a look at the DINAA online tool available to the public, this poster demonstrated several examples of the applicability of DINAA to hands-on learning projects in several areas of learning that focus on real archaeological data sets. 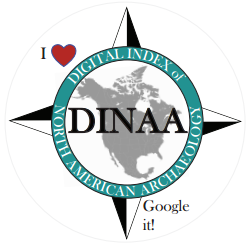 Steven J. Yerka presented a three-minute talk summarizing the DINAA project and its goals, with an invitation to “Google it” and some swag in the form of “I heart DINAA” stickers that became quite popular with meeting attendants. Yerka discussed the fact that while the distribution of archaeological data is not mirrored by current state delineations, it must be managed that way due to the reality of resource management responsibilities. However, DINAA is not meant to be a “black hole” where all SHPO data will reside, but rather a way to translate multiple/all state databases and hundreds of thousands of sites into a useful and engaging system that can be used by professionals, educators, and resource stewards to achieve learning and management goals more easily. Many shouts-out were also given to the DINAA project over the course of the conference in the Twitterverse, coinciding with the launch of the new DINAA Twitter account. Please follow us @dinaa_proj and share your thoughts on the project! This entry was posted in Conferences, Events, Presentations. Bookmark the permalink.